Purists rejoice! This is among the last of the new-condition, non-titled, air-cooled Bonneville Scramblers still available in the entire country. It is and will always be the last of the air-cooled Bonneville's, sure to be a quick collectors item with the simple, old-school air cooled configuration. These last air-cooled Bonnies have the best of both worlds, both wonderfully analog, yet still having modern reliability with fuel injection. The perfect simple bike, whether you want to keep it stock, or use it as the perfect beginning to a full custom machine. This is likely to be the last chance to own the end of an era, with all Bonneville's now sporting a radiator, water-cooling and advanced wiring systems and computers. All that and it is priced to sell with a warranty! ** W'ell also give you an additional 10% off any parts, accessories and apparel you buy at time of purchase (in stock or ordered) to help outfit the bike! Ask salesperson for more details. Price does not include documentation, freight, or taxes and state issued fees. The Look: Lean and basic, just as the originals were, the Scrambler reflects the look of 1960s Triumph twins, converted by their owners for off-road riding in deserts and open scrubland where the power of the engines could be used to the full. With its cut down mudguards and black engine finish, the Scrambler has a classic, rebellious style that is loved by so many riders. Engine: Based on our Bonneville the Scrambler's engine is the classically styled parallel twin, as handsome as those 1960s originals, fitted into a tubular steel cradle frame, just as it should be. 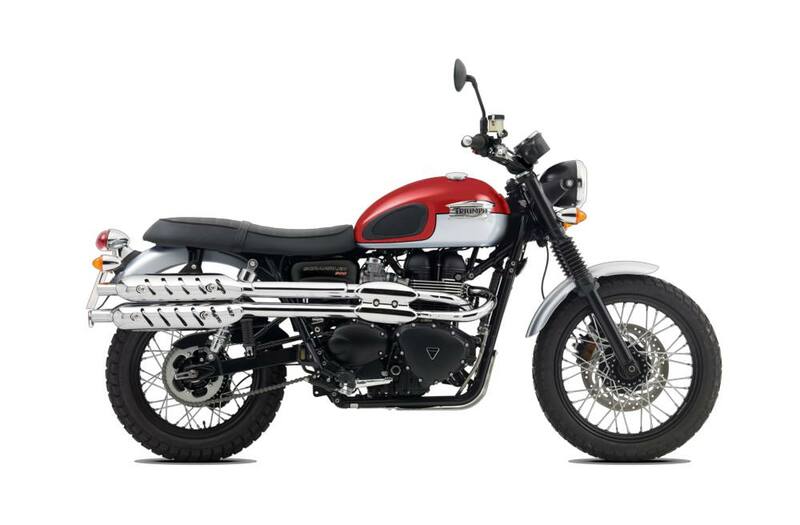 Exhaust: High level twin chromed stainless steel exhaust pipes and evocative heat shields are inspired by the 1960s Triumph TR6C Trophy Special. Wheels: The wheels are wire-spoke with black rims and hubs and wear dual-purpose tyres. The front is 19 inches in diameter to give that authentic off-road look. 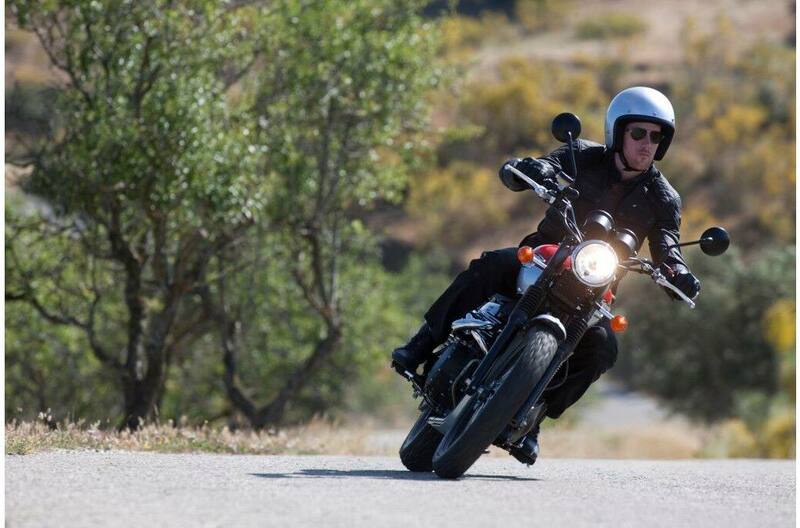 Performance: For the Scrambler we retuned the 865cc eight-valve engine to give you more torque at very low revs. It peaks at a strong 68Nm at 4750rpm but keeps producing useful thrust much lower than that, with 90 per cent of its torque on tap from as low as 2500rpm. The power maximum is 59PS, enough for you to get up to all kinds of fun. Configuration: Powered by a special version of our twin-cylinder Bonneville engine, the Scrambler is air-cooled and styled like the 1960s originals yet quietly bristling with 21st century technology to ensure it's efficient, durable and easy to use. Each cylinder has four valves, all operated by double overhead cams making for quieter operation, more accurate valve control and high rev reliability. And the exhaust meets all noise emission regulations but it's free breathing with a note that gives the Scrambler its unique character. So you get a proven and reliable engine, which is the most fuel efficient in our range. We gave the Scrambler a voice of its own with a crankshaft that differs to the Bonnevilles with a 270 degree firing order. So you get an encouraging, off-beat sound from those twinned high level pipes. Fuel Injection: It even looks as if it comes with old-style carburettors, but we’ve disguised the thoroughly modern fuel injection system, which along with the double overhead cams and contemporary internals makes this a highly fuel efficient, as well as engaging engine. Frame: With the exhausts lifted high out of the way it's possible to see the traditional tubular steel, twin cradle frame in all its glory. Classically styled but strong enough to meet modern handling expectations. The engine is bolted in to lend its own stiffness to the frame which creates a ride that’s light, predictable and completely engaging. Suspension: The pair of chromed shocks we put at the back look classic on the outside but are modern inside. Giving you balanced and effective damping for comfort and controlled handling. And the front forks wear traditional rubber bellows to protect against dirt, while the stubby front mudguard is just like those you would have fitted in the 1960s. Brakes: We matched the Scrambler's performance perfectly with a single front disc, providing progressive, confident stopping power without overwhelming you. Wheels and Tires: Only wire spoke wheels would do for a classic like the Scrambler so that's what we've fitted, now with eye-grabbing black hubs and rims. There's a 19 inch diameter rim at the front to add to the authenticity and style. On those are block-treaded tires, another nod towards the off-road look but with excellent on-road performance in all conditions. Handling: Built to be light and agile yet reassuringly stable when the going gets bumpy. We made the Scrambler forgiving enough to be easy and natural for inexperienced riders but sharp and responsive enough to satisfy even if you’re coming to the Scrambler from larger or sportier machines. Riding Position: The riding position has its roots in off-roading too. We gave the Scrambler high and wide black finished handlebars and footrests raised for better ground clearance. It sits you tall and upright so you are in command either riding around town or cruising along in the country and enjoying the view. It also gives you fine control of the bike when you're hustling it through corners and slipping through traffic because it’s so responsive, obedient and easy to control. Seat Height: The traditional long, flat seat of the Scrambler not only looks the part, it means riders of all sizes can find the ideal position to sit just by sliding into the most comfortable place. This works for the passenger too. There's plenty of room behind the rider without being forced into a single position - snuggle up or sit back, either is fine. Just as desert racers and enduro riders in the 1960s took Triumph twins and personalized them for off-road fun and competition, we started out with the standard Bonneville and modified it to achieve the classic Scrambler look. As well as studying closely the original Triumph TR6C Trophy Special from the late 1960s, the bike which inspired the Scrambler's high level exhausts. The current Bonneville itself made its first appearance in 2001 when it was powered by the first 790cc version of the retro parallel twin, but when the Scrambler appeared in 2006 we fitted it with the latest 865cc engine, to achieve the strong torque at low revs we were after. After that it was a case of researching the archives and adding features to give the Scrambler its convincing 1960s style, while ensuring it still rode like a modern Triumph should. Skid Plate: Brushed alloy Skid Plate for the heritage race feel, clear anodised for durability. Headlamp Grille: Chrome plated Headlamp Grille for the traditional ‘Classic Scrambler’ look. Provides protection for the headlight whilst adding to the retro appeal of the Scrambler. Engine Dresser Bars Black: Textured black with a durable finish the Engine Dresser Bars adds rugged protection to your Scrambler and completes the classic racer look. Fuel Filler Cap Billet: For a personal touch of chrome add the Billet Fuel Cap which allows for easy fastening and removal thanks to its styling. Also check out the Lockable Fuel Filler Cap as a alternative replacement to the standard fuel cap. Seat Options: Made to the highest standard, there are a variety of seats available on the Scrambler made to suit your riding needs. Check out the Configurator and Accessories Catalogue to see what options you have available to you. The Scrambler carries 6,000 mile (10,000km) service intervals. Instrument Display and Functions: Analogue speedometer with odometer and trip information.